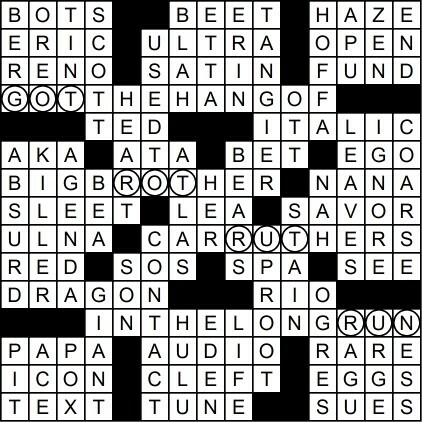 This puzzle is a hybrid of an embedded word theme and a word ladder. It was surprisingly hard to find a suitable pair of words for the ladder that could also be used as a title in the form of “___ to ___.” The toughest area to fill cleanly was the TANGIER section, but adding a cheater square (a black square that doesn’t affect the word count) made it possible. Luckily, the bottom section didn’t need to be redone since the symmetrical cheater square contained an S, forming TUNES/UPROOTS). Got a few musical theatre clues into the mix, as well as a couple of references to “The Wizard of Oz,” which I’m working on now. Here’s the most famous song from “The Apple Tree,” sung by the amazing Kristen Chenowith.